Home / Posts Tagged "quick recipe"
With school back in session, many parents are looking for quick, healthy after-school snacks. This tasty hummus is a great choice! Keep a pre-made bowl in your refrigerator and pair it with some whole grain crackers, raw vegetable sticks or some crusty whole grain bread. 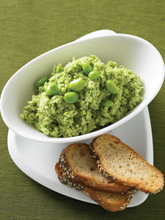 Puree cooked edamame, oil, lemon juice, garlic, cumin and salt in food processor for 30 seconds, scraping sides twice, until almost smooth. Cover and refrigerate until ready to serve. Recipe and photo courtesy of the United Soybean Board. Visit www.SoyConnection.com for additional soy recipes.